For most people, a college education is a worthwhile investment, even after they spend years making payments on their student loans. To minimize the costs of college, many students work part-time jobs or apply for scholarships. Here’s another strategy to add to the list: Why not reduce your (or your child’s) time in a college program — and therefore the costs — by taking self-study exams? It’s a less-common way to reduce the costs of a college degree, but it can save you a significant amount of money. Here’s how the process works. The College Level Examination Program, often referred to as CLEP, is run by the College Board. Students of any age can study for a specific college-level subject test and if they pass, receive college credit for that course. The CLEP exams are similar to high-school AP exams, except that students study by themselves and at their own paces. A student can also take an exam whenever he’s ready, not just at the end of the term. Tests for 33 subjects are offered at more than 1,800 testing centers worldwide and they cost just $80 each, plus any fees charged by the testing centers. The low cost and flexible timing make CLEP exams ideal for high school students, since they can study a subject at school and earn both high school and college credit, as well as home-schooling students. Non-traditional students already who are already in the workforce can study and take exams around their work schedules to earn many of the prerequisites for their college degrees. To illustrate the savings of taking CLEP exams as part of your college preparation, let’s look at in-state tuition at the University of Wisconsin-Madison. In-state tuition costs $5205.12 per semester for course loads between 12 and 18 credits. A passing CLEP score, 65 or above, earns you three credits. If you take six tests, at $80 each, you’ll earn 18 credits for just $460. That’s a savings of $4745.12! Even if you have to retake a few exams, you’d still be ahead financially. Additionally, you’ll save on textbooks, room and board and transportation for a whole semester which is estimated at $7,028 for in-state on-campus students at UW-Madison. Altogether that’s a savings of $11,773.12! Lee Binz of The HomeScholar encouraged her two sons to take CLEP exams. One of them earned enough credits to replace a semester of college, and the other earned a year’s worth of credits. She shares advice on how to strategically use exams to replace certain college courses. Shannen of Middle Way Mom is using the CLEP exams as part of her daughter’s high school curriculum so that she doesn’t have to retake basic courses in college and to help them avoid debt. She offers practical tips about earning credit by exam, including important mistakes to avoid like taking too many tests at once or not varying study materials. Ready to shave thousands off the cost of your or your child’s college degree? Before you sign up for a ton of exams and buy a bunch of study materials, take a moment to consider your options. This strategy won’t be a money saver if you find out that your college doesn’t accept CLEP exam scores in exchange for credit. High school students who want to go the CLEP route should check their prospective schools’ policies and talk to the admissions office about their plans to apply exam credit toward their degrees. Each school will have its own policy on how many credits can be earned through CLEP tests or when the exams must be completed. For example, UW-Madison only accepts CLEP exam scores of 65 and above for exams that were passed before a student earns earn 16 semester hours of college credit. Unless you’re very familiar with a subject and do well on the free practice tests, you should obtain a copy of The College Board’s test-prep book for the exam you plan to take. You can get the books from their site or on Amazon, but why bother buying them if you’ll only be using them a short while? That’s what my former colleague, Apiphany Riggin, did to study for the CLEP exam that she took. Since she studied for just two weeks before passing the exam, not buying the book added to her savings. The class at her college would have cost over $2000. If your library doesn’t have a copy, request one through their library loan program. If you can’t find the books at the library, share a request on Facebook and Twitter to see if anyone has old books you can buy or borrow from them. Home-schooling families can probably find someone in their network that has the books and will lend them out if none of the children are using them. Increase your chances of success with practice questions and exams at Free Clep Prep. Education Portal offers a free trial of their online video and quizzing services. If worse comes to worst and you can’t find a copy of the book you need, buy a copy yourself (even used on Amazon). When you’re finished with it, sell it online or to someone else in your network. 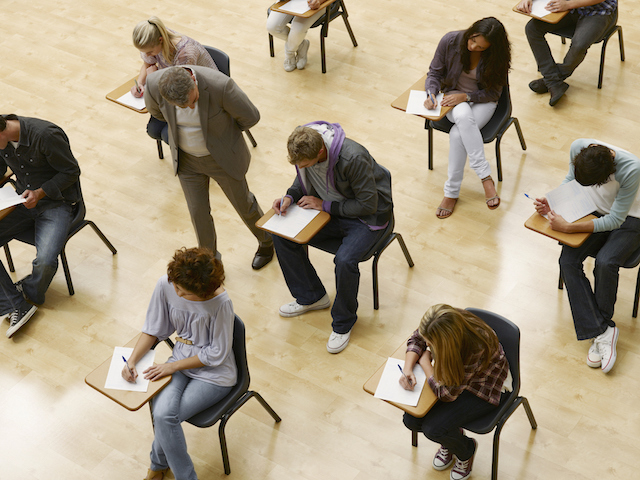 Your Turn: Have you taken exams for college credit? Tell us about it in the comments.